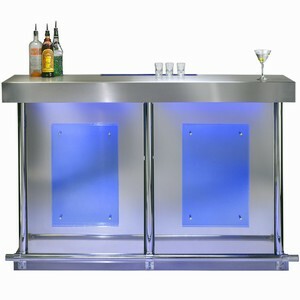 Modern home bars - the ultimate in making a fashion statement in your home. These days modern bars are typically smaller and less dominant than the traditional dark heavy wooden bars. They are typically made out of steel and glass, with well defined lines and in some cases wooden inlays to give it a soft touch. Very importantly, modern home bars have innovative lighting – lighting behind and under the bar in various bright colors. If you are considering a modern bar, make sure it fits the rest of your home’s style. For example, a modern stainless steel bar will not fit in your colonial style home with antique furniture. Make sure the bar stools (and other furniture, like ottomans and coffee tables) fit the style of the bar. Typically, the bar stool can and should be purchased in a set with the bar where possible to avoid the task of having to look for matching bar stools later. In fact, this goes for about any bar – it can be a daunting task to find matching bar stools (of the correct style, color and height) later on. To get further inspiration, go have a cocktail at a trendy cocktail bar in your area. Don’t miss our home bar guide. We explore great ideas on home bar design and construction, home bar décor, building a home bar and home bar furniture.